The latest promotional material from Captain Marvel throws the spotlight on Talos, Goose, and Carol Danvers. We’ve been treated to two trailers for the upcoming standalone Carol Danvers movie, and these new character posters are offering a bit of a different look at Talos and an intergalactic look at Goose. Captain Marvel is only two months away from hitting theaters and Marvel Cinematic Universe fans are preparing for the unknown. There’s been plenty of hype surrounding Brie Larson’s introduction into the MCU, but we’re still in the dark as far as the storyline is concerned. Perhaps the coolest Captain Marvel poster thus far is the one featuring Carol Danvers’ cat Goose. The feline is shown in space with a constellation printed on his chest along with a silhouette of Carol Danvers flying near him. It’s unclear at this time if Goose will take on his other form that he has in the comics, but it has been rumored that the other form could be the reasoning behind Nick Fury’s missing eye. Goose looks relatively normal in the poster and even a bit regal. Talos looks a bit off in his character poster from how he looks in the latest Captain Marvel trailer and images that we have seen. 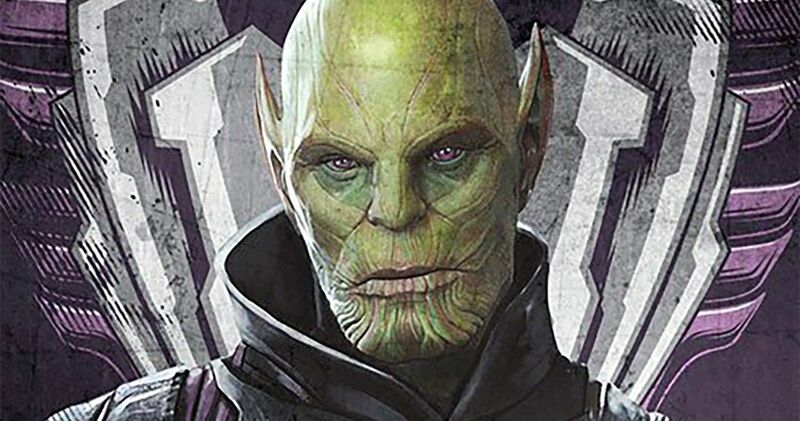 The Skrull leader has a mostly light green head and the image doesn’t show off any of the purple highlights that have are in the movie. Even though the look is a bit off, it’s still pretty cool to see and fans are getting ready to see Ben Mendelsohn as the Skrull leader on the big screen. The other two posters put the focus on Captain Marvel herself. They are new poses with Brie Larson in the classic red, blue, and gold suit that fans know from the comics. The movie isn’t going to be a traditional origin story, according to Marvel Studios boss Kevin Feige, and we know that Carol Danvers will have her powers at the start of the movie. Jude Law has said that Danvers is going to learn how to harness and properly use her powers during the course of the movie, which should be pretty awesome to see. Brie Larson has also hinted that her character might have a bit of a temper towards the beginning of the movie if you’ve been following the latest Marvel movie news. It looks like Jude Law is officially playing Yon-Rogg. A new action figure and a Funko Pop! vinyl figure have spilled the beans. But, some MCU fans are still under the impression that he might be playing Mar-Vell too, possibly as a double agent. However, that has yet to be confirmed at this time. A with almost anything having to do with Marvel Studios, we’re just going to have to be patient and wait for the movie to hit theaters. You can check out the latest Captain Marvel posters below. The villainous Talos is front-and-center in this official new #CaptainMarvel promo poster!